If you want to “be your own gym” and build muscle and strength with bodyweight workouts, then this article is for you! Poke around on the Internet for answers and you’ll find all kinds of opinions. Some people say that weightlifting is better for bodybuilding but not for building a “sleek,” “Hollywood” type of physique. Others still say that bodyweight training the most “functional” way to train. Well, in this article, we’re going to set the record straight on all these points and more. By the end, you’re going to know the pros and cons of bodyweight exercises and whether they’re suitable to your goals or not, and I’m going to give you a highly effective bodyweight workout routine that you can start on right away. Are Bodyweight Workouts Good for Gaining Mass? Anything that involves vigorous physical activity can qualify as exercise, but training connotes a more systematic approach toward a known goal. Zumba is exercise. Bigger Leaner Stronger is training. If your goal is to stay healthy and lean, exercise (and proper dieting) can get the job done. If you want to build a lean, strong, and muscular physique, though, you need to train. Which brings me to bodyweight workouts. There’s no question that they’re great exercise. Some of the best, actually, because they involve both cardiovascular and muscular conditioning. Convenience and flexibility (you can do them at home, on the road, etc.). Affordability (no gym membership or home gym needed). Time efficiency (no driving to the gym, waiting for equipment, etc.). Privacy (no pervy dudes or peacocking gymbros). If you’re looking to “stay fit” (build some muscle and strength and stay lean), and you don’t like gyms or can’t get to one, bodyweight workouts might be perfect for you. If you’re looking to build a large amount of muscle and strength as quickly as possible, though, they’re not the best choice. This is because bodyweight workouts have limited value as a training method. The main reason for this has to do with something called “progressive overload,” which is the primary mechanical driver of strength and muscle building. Progressive overload refers to increasing tension levels in the muscle fibers over time. The most effective way to do this is to progressively increase the amount of weight you’re lifting (add weight to the bar). This is why strength is highly correlated with muscle size. You’d be hard pressed to find a guy with small legs that can squat double his body weight for reps, for example. It tends to focus on increasing repetitions but not weight (overload), and this is great for building muscle endurance, but not size and strength. That is, working up to 100 pushups or 20 pullups in one go isn’t going to result in nearly as much muscle growth as working up to bench pressing 1.5 x your body weight or deadlifting 2 x your body weight for reps. Researchers call this the “strength-endurance continuum,” which is a polysyllabic phrase for a rather simple concept: if you want to get big and strong, you need to prioritize resistance training with heavy loads. Now, there are ways to incorporate progressive overload into your bodyweight workouts, which we’ll be talking more about soon, but they don’t fully offset this disadvantage. Another handicap with bodyweight workouts is you miss out on several powerful muscle-building exercises. 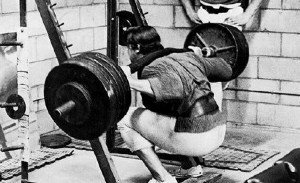 Unfortunately, there are no bodyweight exercises that can fully reproduce the whole-body effects of heavy squats, deadlifts, bench and military presses. They train many muscle groups at once and they allow for very heavy weights to be handled safely (maximum overload). The bottom line is any resistance training program–bodyweight or otherwise–that’s missing any of these movements would benefit from including them. You can make do with exercises that we’ll discuss soon, but anyone that says that you can duplicate the level of muscle activation from an 85% of 1RM deadlift with a bodyweight movement is lying. If bodyweight training isn’t ideal for building muscle and strength, why is this dude is so jacked? How long has he been training for? If someone has been doing bodyweight workouts diligently for 10+ years and knows how to diet, he’s going to have a good physique. That doesn’t mean it was the most effective way to get there, though. What is his training history like? When someone with a killer physique does bodyweight workouts exclusively, it doesn’t mean that’s how he built his body to begin with. I know many people that gained a large amount of muscle and strength with traditional weightlifting and then transitioned more into bodyweight training for various reasons (lifestyle changes, new challenges, etc.). What are his genetics like? Some people’s bodies respond incredibly well to resistance training of all forms and others respond quite poorly. If you’re taking advice from a high-responder but are yourself a low- or even middling-responder, you’re not going to see anywhere near the gains. How likely is it that steroids are involved? Drugs are everywhere in the strength and muscle-building space, and they change everything. Learn to spot the obvious abusers. If you want to get an accurate idea of how well a training or diet methodology works, you want to look at a broad cross section of results, not chase after outliers. If you go searching for bodyweight exercises and routines, you’ll quickly be overwhelmed by the sheer volume of choices. The good news, though, is out of the hundreds and hundreds of body weight exercises you could do, a small minority deliver the vast majority of potential benefits. As you’ll see, your primary focus in bodyweight workouts is improving in a few basic areas: pushing, pulling, and squatting. There are many variations of these movements and ways to make the more difficult, of course, but they are the foundation of all good bodyweight training. So, let’s review the best of these types of bodyweight exercises and then look at how we can combine them into an effective and challenging workout routine. No bodyweight workout is complete without some form of pushup. It’s one of the simplest and most effective ways to train your chest, shoulders, and arms, and it doesn’t require any special equipment. I’m going to recommend that you do several types of pushups in your bodyweight workouts. The pike pushup is a pushup variation that is great for training the shoulders. The Dive Bomber Pushup is a good progression from the pike pushup (meaning it’s an exercise you progress to once you’ve built considerable strength on the previous). It’s a complete upper body exercise because it emphasizes your chest, shoulders, and triceps at different points in the movement. In terms of bodyweight shoulder exercises, it’s hard to beat the handstand pushup for sheer difficulty (and thus overload). I want to shy away from exercises that require special equipment, but I need to mention the dip because it’s one of the absolute best upper body exercises you can do, bodyweight or otherwise. There are two types of dips you can do: triceps (or bench) dips and chest dips. 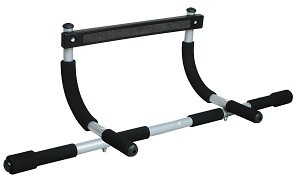 These are also exercise that can’t be done without equipment…but a pullup bar is cheap and, in my opinion, vital. It’s vital because if you want to get the most out of your bodyweight training, you must be doing chinups and pullups. 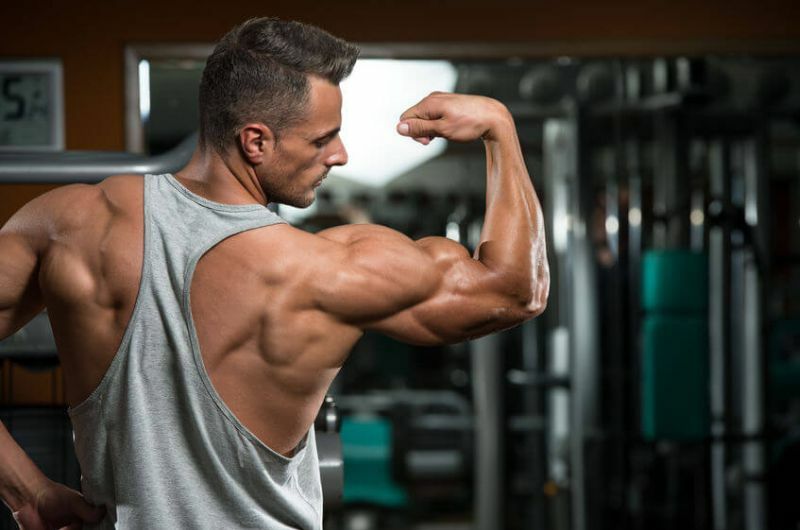 They train every major muscle in your back and involve the biceps to a significant degree as well, and they do it in a way that just can’t be replicated otherwise (outside of the gym, that is). There are many pullup variations you can do, of course, but you should build a foundation of strength with these two before progressing to more advanced types. 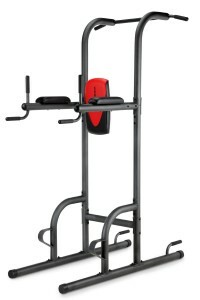 If your budget and workout space permits, you can go in for a Power Tower instead, which allows you to do your dips, pullups, and ab exercises (that we’ll be talking about soon). Just about every popular resistance training program you can find involves some sort of squatting. It’s the simplest and most effective leg-building exercise you can do. This exercise is the bodyweight equivalent of the barbell back squat, and if you want to build strong legs, you’re going to do a lot of it. The squat jump is a progression from the basic bodyweight squat that adds a dynamic “explosive” element to your training. The Shrimp Squat is a good introduction to one-legged squatting (which is a good progression from two-legged variations). The pistol squat is a difficult progression from the shrimp squat that requires a considerable amount of strength and balance. The lunge is primarily a quadriceps exercise but all the major muscle groups of the lower body come into play. The Russian leg curl is a fantastic exercise for isolating your hamstrings. The burpee is a classic full-body exercise that also builds your cardiovascular capacity. The hanging leg raise is one of my favorite exercises for training the core (and the rectus abdominis in particular). The bicycle crunch is a popular abs/core exercise that is particularly good for training the obliques. The plank is often hailed as the ultimate core exercise, but research shows that’s a bit of an overstatement. That said, it definitely valuable enough to include in your bodyweight workouts. That’s it for my exercise recommendations. The key isn’t just doing exercises–it’s progressing on them. We recall that as a natural weightlifter, the most important type of progression is overload. 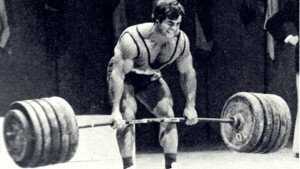 When you’re weightlifting, the easiest way to do this is to add weight to the bar. Add weight to your body using a vest or, where possible, a dip belt. Progress to a more difficult exercise. We’re going to focus on #2 in this article because it requires no additional equipment and, frankly, it works better in most cases. So, push yourself to make progress in your workouts and eat enough food and your muscles will grow. Alright…it’s time to put some rubber on the road. Let’s start your journey into bodyweight training with an assessment of your current fitness level. Do one set of the following exercises to failure and record how many reps you get of each. Rest a few minutes in between each exercise. After 8 weeks of the workout routine I lay out below, retest yourself to see how you’ve progressed. Let’s break down how all this works. All sets are done to one or two reps short of failure. 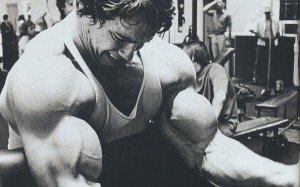 You don’t have to go to absolute muscle failure every set to make progress, but you need to come close. You want to rest enough in between sets for your heart rate and breathing to settle down but not so much that you lose your pump and workout intensity. Once you can do 20 reps of a given exercise in one set, progress to the harder variation of the exercise. Progressions are indicated by the > symbols. So, for example, once you can do 20 pike pushups, you then start doing dive bomber pushups for that and all future workouts. Once you can do 20 dive bombers, you start doing handstand pushups instead. 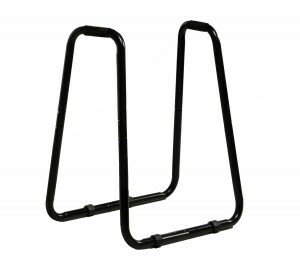 And in the cases where there are no progressions (plain pushups and bodyweight squats, burpees, pullups, etc. 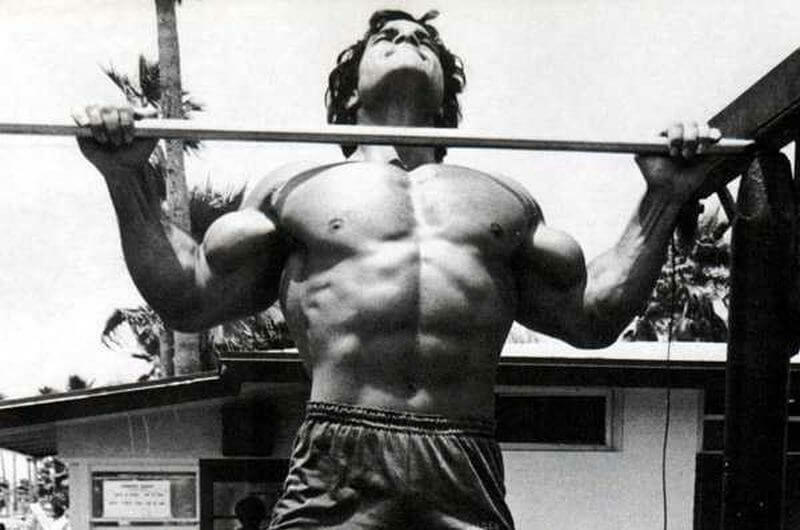 ), your goal is to simply increase the amount of total reps you can do each workout. If you can’t do a pushup or chinup yet, start with a regression that you can do. For example, if you can’t do one chinup yet, do chinup holds until you can do 20 and then progress to chinups. Bodyweight workouts (and the lower body workout in particular) are pretty cardio intensive. If you’re not sure how much or what type of cardio you should do to reach your goals, check out this article. And that’s why I made my own, and I called it PULSE. 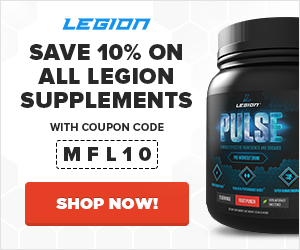 Clinically effective dosages of 5 natural, performance-enhancing ingredients backed by peer-reviewed, well-designed, and well-executed research: caffeine, theanine, citrulline malate, beta-alanine, betaine, and ornithine. Bodyweight workouts have many advantages but aren’t necessarily for everyone. They’re fantastic exercise and so-so strength and muscle builders, but they’re not as practical as weightlifting for maximizing muscle growth and sculpting a physique. So, if you’re an experienced weightlifter looking for a new challenge, this could be for you. You can use bodyweight workouts to maintain your muscle and build muscle endurance. What’s your take on bodyweight workouts? Have anything else to share? Let me know in the comments below!